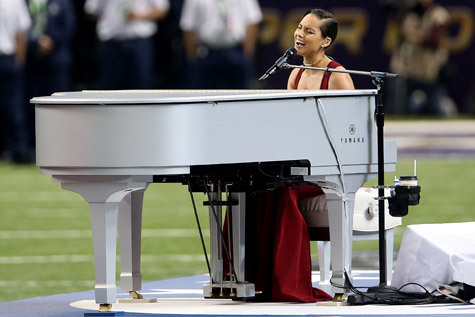 Alicia Keys performed the National Anthem at the 2013 Super Bowl. Now people have their knickers in a twist and are implying that Alicia was disrespectful during the performance. Now why would people think this you might ask? Well she failed to stand up for the National Anthem and add to this she had one of the longest renditions of the Star Spangled Banner on record and people are not happy. Complaints have been flooding the NFL from pissed of people and they don’t look like they are stopping soon. Alicia’s rep has issued a statement and to find out what Alicia has to say about the hullabaloo, head over to our friends at Yazmar HERE!